K-Tuned Intake Manifold - Pann Auto Performance - San Diego largest aftermarket automotive performance parts - What do you drive? NOTE: The stock water pump needs to be modified and a K-Tuned AC/PS Eliminator Pulley setup must be used. The K-Tuned Intake Manifold features a very large 4.78L sheet metal plenum shaped in the signature tapered Magnus format. If you look closely at the plenum base and the TB flange, you’ll find two custom 6061 billet aluminum pieces that are precision machined using a CNC 3D profiling process. This special CNC process is what ultimately helped make this manifold design possible, allowing us to make the necessary multi-axis CNC cuts. The 90mm throttle body flange matches up perfectly to the plenum and is tapered inward to ensure there is no restriction to the incoming air. The throttle body bolt pattern matches up to the 86-93 Ford Mustang 5.0L specs, which means our K-Tuned 90mm Throttle bodies will bolt up seamlessly. 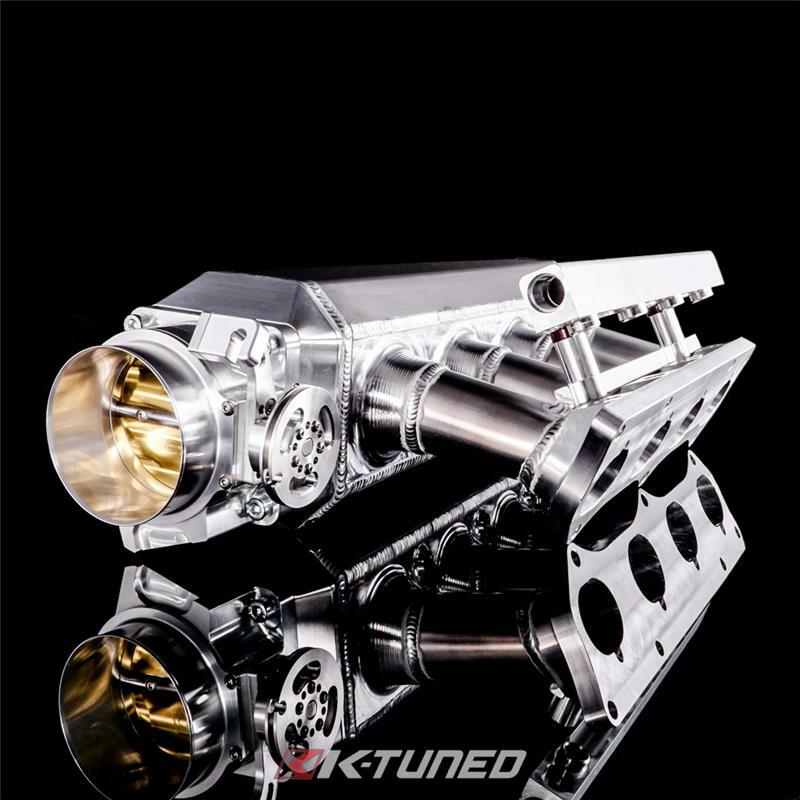 The custom billet plenum base is a work of art, with four precision machined internal V-stacks that are designed to increase runner entry air speed. We also provided 3 × 1/8 NPT vacuum ports that are neatly tucked away on the plenum base, and positioned between each runner. The runners themselves, measure 5.75” long with a large diameter of 1.875”, and are capable of supplying even heavily modified K-Series engines with plenty of air. The manifold flange at the cylinder head is available for K20 and K24 heads and is another 6061 billet piece, that maintains proper port entry and injector angles. Included with our manifold is a brushed aluminum K-Tuned Fuel Rail, which is held in place on a rail mount that is designed to keep the stock phenolic fuel rail spacers in place and accept both stock or aftermarket K-Series fuel injectors. As usual, we include all the hardware, specifically the bolts for mounting the manifold to the cylinder head and the 4 bolts for our throttle body. Last, but not least, we placed an aluminum K-Tuned badge on the front of the plenum to add a nice finishing touch.